How are your resolutions going? Not great? No worries — you’ve got another chance to start the New Year right. Chinese New Year is a bright, colorful holiday steeped in tradition and it’s also the perfect opportunity to indulge in some delicious food. In case you’re looking to throw a party, this year Chinese New Year falls on Feb. 18 (2018 marks the Year of the Dog), so there’s still a little time to plan out a great menu for the celebration. From chicken wings to dumplings and wontons, there’s a ton of variety you can bring to the table. The recipes below are variations of several traditional dishes. They’re full of flavor and great to serve to mingling guests. 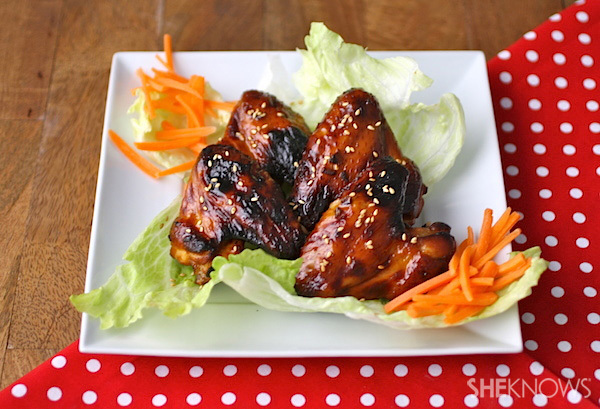 These wings are seasoned with a simple marinade and make an ideal appetizer for a crowd. To a large, sealable plastic bag, add the oyster sauce, soy sauce, ginger and honey. Add the chicken wings to the bag, and seal it closed. Use your hands to massage the marinade onto the wings, then refrigerate for at least a few hours or up to overnight. Heat your oven to 400 degrees F. Place a sheet of aluminum foil over a baking sheet, and lightly spray it with the cooking spray. Place the wings on the sheet so they are not touching. Use a brush to lightly add a bit of the marinade to the tops of the wings, then discard it. Bake for 20 – 30 minutes or until golden on top and the chicken is cooked through. Remove from the oven, and sprinkle with toasted sesame seeds. 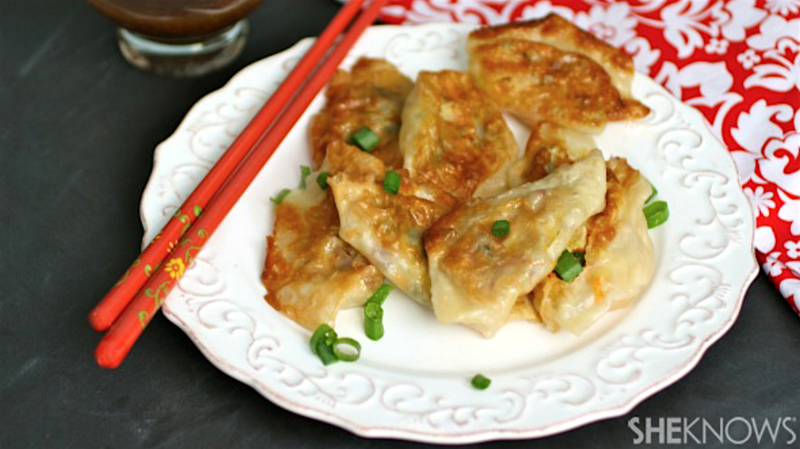 Pot stickers (or dumplings) make a truly special treat. This recipe is quite easy to make (use prepackaged shredded cabbage to make your prep even simpler), but don’t fret if your “folding” technique is lacking — just make sure to tightly seal all the edges after stuffing them. Your guests will love digging into these tasty packets. In a medium bowl, combine the cabbage, carrot, onion, garlic, soy sauce, sesame oil and black pepper. Mix well. In a small bowl, whisk the cornstarch with about 1/4 cup of water. One at a time, lay a wonton wrapper on a flat work surface (keep the remaining wrappers covered with a damp paper towel). Dip your finger into the cornstarch-water mixture, and run it around the edges of the wrapper. Place a teaspoon of the veggie filling in the center of the wrapper. Fold the top and bottom edges together to form a triangle. Fold the tip of the triangle down, then fold the 2 sides in toward the center. You may need to use a bit more of the water mixture to help ensure the edges are completely sealed. To a large skillet over medium heat, add the oil. 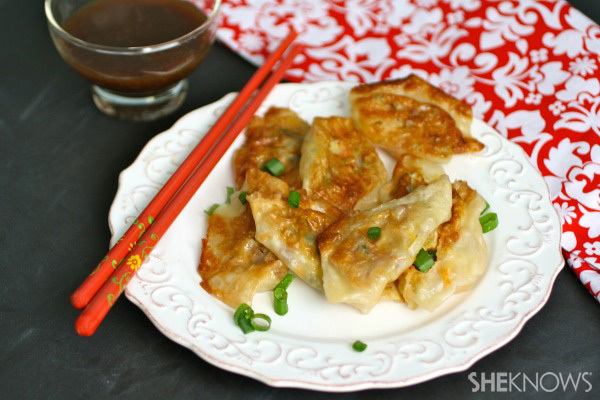 When the oil is hot, carefully add the pot stickers smooth side down, and cook for a minute or more, until golden. Add the 1/2 cup of water to the pan, and put the lid on. Cook for a minute, remove the lid, and continue to cook until most of the liquid is absorbed. Remove from the skillet, and serve warm with your favorite dipping sauce. You’ve likely enjoyed crab rangoon at your favorite Chinese restaurant in the form of fried wontons stuffed with a warm, creamy crabmeat mixture. I’ve deconstructed this version and switched things up a bit. Bake the wontons in the oven for just a few minutes, then use them to dip into this cold, creamy and seasoned dip. What a treat! To a medium bowl, add all the ingredients up to the wonton wrappers, and mix well. Taste, and adjust the seasoning as needed. Refrigerate until ready to use. Heat your oven to 350 degrees F. Line 2 baking sheets with aluminum foil, and set them aside. Use a sharp knife to cut the wonton wrappers in half, diagonally. Place the triangles on the baking sheets so they are not touching. Dip your finger into a small bowl of water, and run it across the tops of the wrapper pieces. Sprinkle with the black sesame seeds. Bake for about 4 minutes or until lightly golden. Remove from the oven, and serve with the dip. A version of this article was originally published in January 2014.